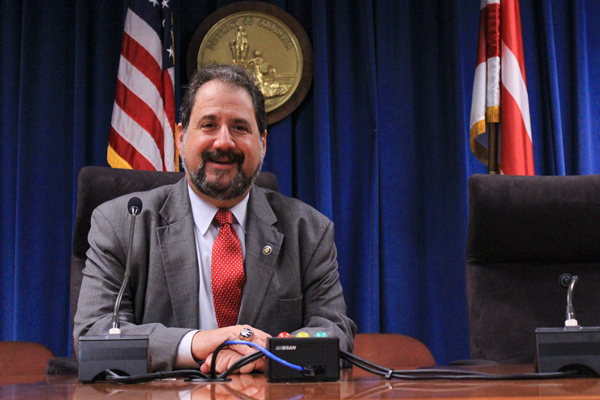 Paul Strauss, the District’s shadow senator, said the D.C. statehood referendum is an advisory measure, so some aspects could change if D.C.were to become a state. When D.C. residents cast their ballots Tuesday, they will have the chance to weigh in on whether or not the District should be the nation’s 51st state. This week D.C. citizens will vote on a referendum that proposes to grant the District representation in Congress, making it equal to other states. If the measure passes, it will mark approval of the potential state’s proposed constitution, state’s proposed boundaries and a guaranteed representative form of government. But even if the referendum passes, D.C. will not immediately become a state. The referendum is a way for officials to show Congress that citizens support becoming a state, and the results will be used as a way to gain traction in Congress. Then, Congress can choose to hold hearings to create a bill that would legally make the District a state, which would have to pass both houses and be signed off by the president. Paul Strauss, the District’s shadow senator and a member of the New Columbia Statehood Commission, said because the question on the ballot is an advisory referendum there is still an opportunity to change specific aspects of the proposed state of D.C., including the boundaries and the name of the new state. Here are some of the referendum’s main points. The constitution for the state, which was released in May and approved by the D.C. Council in June, includes information on how the new state would run. Strauss said several changes have been made to the constitution since the first draft was released in May, including the proposed name of the new state. The New Columbia Statehood Commission originally chose the name New Columbia, Strauss said, but the commission changed the name to The State of Washington, D.C. after public outcry. D.C. in the new name would stand for Douglass Commonwealth, not District of Columbia. Bo Shuff, an alumnus and the director of advocacy at D.C. Vote, said the ballot that will be used Tuesday still refers to the new state’s name as New Columbia because the referendums had to be approved months in advance and the name wasn’t updated until last month. The suggested boundaries for The State of Washington, D.C., which are covered under part three of the referendum, show the proposed state as the entire existing city region, excluding the National Mall and government buildings, according to documents from the District’s Office of Planning. The area of the District that includes the National Mall and other federal properties would be separate from the state and called the “Seat of Federal Government.” With these boundaries in place, only public areas would be excluded from the new state, and all residents would be represented. “The goal of the boundaries was to make it true that every single resident would become part of the new state,” Shuff said. Under the fourth section of the referendum, the new State of Washington, D.C. would be guaranteed an elected representative form of government. The new state would follow the same processes as other states to elect Congressional representatives. D.C. currently has one non-voting member of Congress. That representative – Del. Eleanor Holmes Norton, D-D.C., who is up for reelection – can draft legislation and vote in committee but cannot vote on bills. If D.C. were to become a state, Mayor Muriel Bowser would become the governor and members of the D.C. Council would make up a new legislative assembly, similar to each state’s internal legislative branches. These leaders would remain in their seats until the positions can be filled through an official election, according to the constitution. If the referendum is passed on Election Day, the District will not automatically become a state. David Bardin, a retired lawyer and volunteer for the Statehood Yes! Campaign and the Statehood Speakers Bureau, said the referendum serves as a “public opinion poll” and will show whether District residents support statehood. The time between the referendum passing and approval from Congress and the president can vary: One of the most recent states to enter the Union was Alaska in 1959, and the process took almost 10 years from start to finish, Bardin said. “The important thing is if the referendum is passed, for every yes vote it shows that there is an American citizen living in the District who is dissatisfied by the way they are being treated,” Bardin said. Bardin added that after presenting the results to Congress, statehood supporters will need to make sure Congress takes action. Some of the ways to do this include hiring lobbyists, launching a national campaign to educate U.S. citizens about D.C. statehood and speaking to the District’s community, he added.